The Steamboat Conservation Partnership has released its 2018 report to supporters on the completion of their ninth successful year of operation. Here is that report. During our 2017-2018 fiscal year (July 1, 2017 through June 30, 2018), we raised $14,818.86 for Capitol Land Trust (CLT), earmarked to finance part of their operational activities within the Steamboat Peninsula Region where most of us live and/or own property. This was slightly below our annual goal of $15,000 in collections. Over the nine years of the existence of the SCP, we have raised $148,447.96 for CLT, which is $13,447.96 above our goal of $135,000 for that nine-year period. We should all be very proud of generating these funds to ensure that many of our natural areas will be available to our children, grandchildren and beyond. 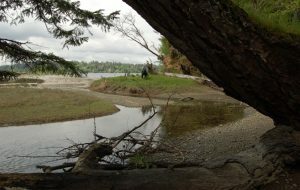 The SCP is a five-year agreement between the Griffin Neighborhood Association and Capitol Land Trust during which we attempt to raise at least $15,000 per year to help finance the operational activities of CLT within the Steamboat Peninsula Region (the watersheds of Eld Inlet and Totten Inlet). After completion of the first five-year agreement in 2014, a second agreement was made. We have just completed the fourth year of this five-year agreement. The SCP is unique. We are told that no other agreement for raising earmarked funds exists between a neighborhood association and a land trust in the nation. The Adams Cove Preserve, 35 acres and a pocket estuary in Totten Inlet. The Lower Eld Estuary Preserve, 55 acres along southern Eld Inlet. The Schmidt Conservation Easement addition, 5.5 acres near Hunter Point, adding to 29 acres already conserved. In addition, our donations were used to establish a stewardship fund to protect the remaining 175 acres of the Wynne Tree Farm. The 530 acre Wynne farm has now been conserved. This jewel of a farm located in the Schneider Creek Valley with the headwaters of Schneider Creek. These conserved properties are in addition to many other properties in our area conserved in prior years, including the Triple Creek Farm, Randall Preserve and Allison Springs, and Willits Tree Farm. Appleby Conservation Easement. One of several easements within our region. Click on the image for more information. Photo by Capitol Land Trust. Humans have a unique relationship to land; it is at the same time familial, emotional and legal. Some land is passed down from one generation to the next and represents family history and significance beyond its physical attributes. 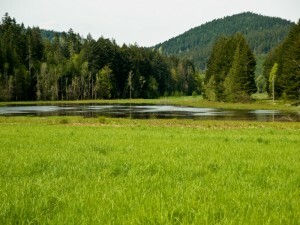 Some landowners bought their land because of the beautiful setting or the richness of its natural features. Landowners who cherish their land often want to ensure it is managed in a way that maintains what they love about it into the future, including after they’re gone. One way to ensure the land is used in line with the owner’s wishes is through a conservation easement. A conservation easement is a legal agreement between a landowner and another party – often a land trust – regarding how the land will be used for years to come. This agreement is recorded by the appropriate government entity and becomes part of the permanent legal description of the land. Capitol Land Trust has partnered with many landowners to develop these agreements, which can be tailored to the desires of the owner while protecting important ecological values – Capitol Land Trust’s goal. Conservation easements also can be employed to maintain working farms and forests ensuring they can continue to produce agricultural or forest products, often for local use. An easement can identify different uses for distinct parts of a property. For example, land surrounding a stream might be left in its natural state, while a field can be used for growing crops, and yet another area for residential use. With an easement, the landowner continues to own the land while the land trust agrees to ensure that the land is used in accordance to the agreement. This includes making sure future owners comply with the easement and, if necessary, bring legal action to enforce the agreement. Capitol Land Trust’s first conserved property was protected through a conservation easement. While the trust also has purchased land for conservation purposes, protecting land through conservation easements can be cost-effective and lessens the burden of long-term management on the land trust. With 38 easements in our portfolio, this partnership with private landowners has meant that some of our area’s most ecologically significant and important working lands are protected forever. Click here to learn more about conservation easements and land trusts. Click here to begin learning more about how you can conserve your land. In 2009, the Griffin Neighborhood Association and Capitol Land Trust formed the Steamboat Conservation Partnership. Conservation easements are one important tool available to help the Partnership meet its goal of conserving the rich and diverse natural landscapes of the Steamboat Peninsula region. Click here to learn more about the Steamboat Conservation Partnership. This time of year, many of us are receiving requests to make year-end contributions to various worthy causes. With the Steamboat Conservation Partnership there exists a unique opportunity to give in a manner that will directly benefit those of us living here in the Griffin area. If your year-end planning includes making contributions to non-profit organizations, consider this your invitation to learn more about the SCP. The Steamboat Conservation Partnership is a unique-in-the-nation collaboration between a local neighborhood group and the very successful Capitol Land Trust. The mission of the Steamboat Conservation Partnership is “to conserve the rich and diverse natural landscapes of the Steamboat Peninsula region.” Since this collaboration took effect, we have been able to protect more than 300 acres in the Steamboat Peninsula region. The Capitol Land Trust has a proven record of working with land owners, businesses, and government to identify and preserve shorelines, rivers, forests, prairies, and working lands. You can learn more about the Steamboat Conservation Partnership on our web page at steamboatisland.org/scp You will find a video there, that describes the work of the Capitol Land Trust. We welcome contributions of any size. Should you choose to make a contribution to the Steamboat Conservation Partnership, you will find a link on our web page and you can make a secure donation using a credit card. If you prefer, you may mail a check directly to the Capitol Land Trust. Insert “SCP” or “Steamboat Conservation Partnership” in the memo part of the check so we can receive credit. Your check should be mailed to Capitol Land Trust, 4405 – 7th Ave SE, Suite 306, Lacey, WA 98503. In reply you will receive a letter, for your tax records. And thank you, for supporting the Steamboat Conservation Partnership. The camas plant is an important part of South South prairies and we recently published an article regarding efforts to restore a piece of the prairie many of us pass through, every day. 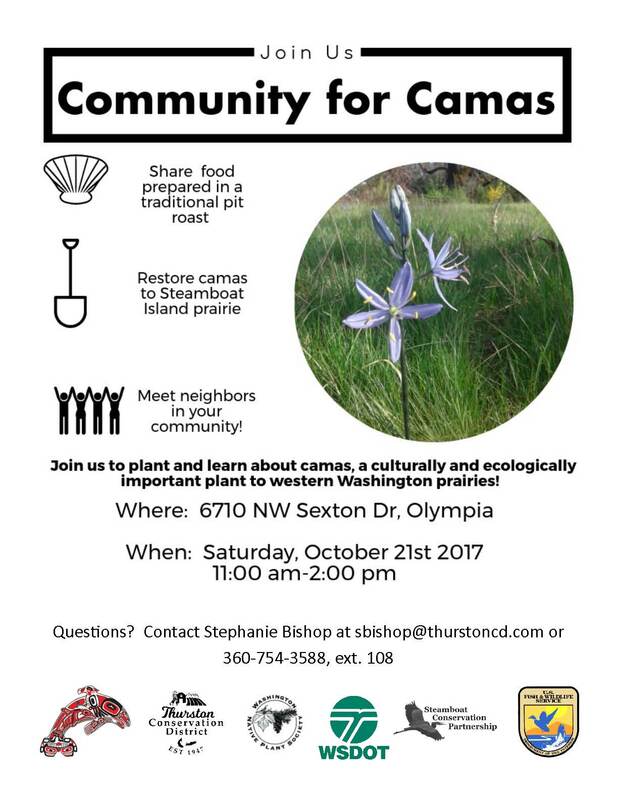 You are invited to join the Squaxin Tribe and Thurston Conservation District to celebrate prairies, community, and camas. Parking will be on the street with overflow parking at Griffin School. 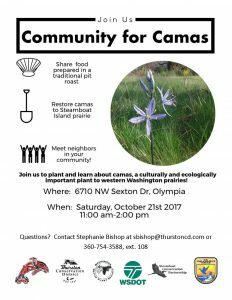 This project brings together the tribe and community members to restore a small prairie in the Steamboat Island/Highway 101 interchange by planting camas and removing invasive species. Through restoration and partnerships, this parcel of land can be used as a teaching space for students of all ages! Meet neighbors in your community! If you have questions, contact Stephanie Bishop, of the Thurston County Conservation District, at sbishop@thurstoncd.com or 360-754-3588, ext. 108. Many thanks to the event sponsors: Squaxin Island Tribe, Thurston Conservation District, Washington Native Plant Society, Washington State Department of Transportation, Steamboat Conservation Partnership, and the U.S. Fish & Wildlife Service. There are two magnificent oak trees on the corner of Steamboat Island Road and Sexton Drive. As a Griffin parent, I have driven by those oaks hundreds of times on the way to school, marveling at the dense mats of moss and ferns growing on strong limbs and the remnant prairie plants growing beneath. Late last winter, I stopped. 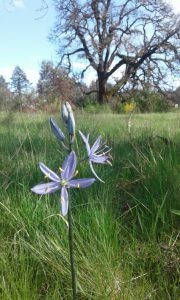 I walked under the oaks and imagined how this native prairie habitat would look with rivers of camas running through it like long ago. The picture of a restored prairie in our backyard was too pretty to let go of, and is what prompted me to start doing some digging. It turns out this small parcel is a part of Schneider’s Prairie and owned by the Washington Department of Transportation (WSDOT). WSDOT also happens to be very supportive of protecting the oaks and restoring the prairie. Native prairies like this used to cover large sections of Thurston County, though mostly down south near the Glacial Heritage Preserve and Mima Mounds where some are still present. Today only about 3% of this habitat still exists. Scotch broom and sun-loving Douglas fir thrive in these open areas and conversion to forest can happen quickly without the traditional land management practice of controlled burns. 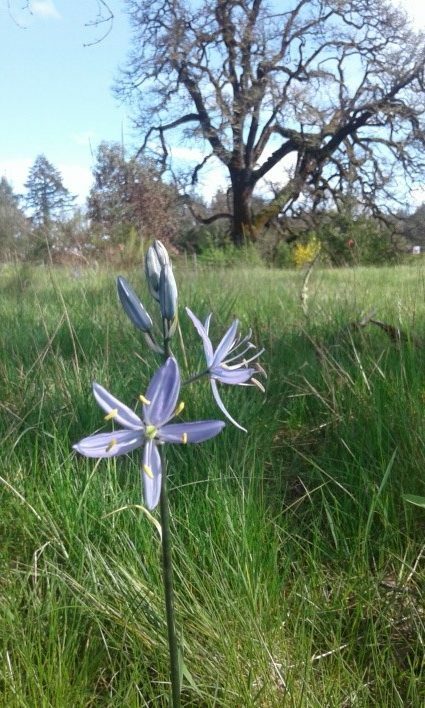 Camas, that beautiful blue flower growing in pockets around the Steamboat/101 interchange, is a culturally important “First Food” cultivated by indigenous people of the area. Burning prairies not only increases this food source, it improves soil conditions to support myriad pollinators and endemic species. According to local historian Steve Lundin, Schneider’s Prairie was probably last burned more than 200 years ago. Presenting the idea of prairie restoration to the Steamboat community was like setting a spark in a dry field. A single email to members of the Steamboat Conservation Partnership (SCP) this spring resulted in an immediate site visit and two work parties. Outfitted with gloves, chain saws, weed wrenches and clippers, SCP volunteers and other friends and neighbors removed the encroaching Douglas fir seedlings, cut down non-native black locust trees, pulled scotch broom and whacked back 10’ high Himalayan blackberry! After reaching out to Griffin School, seventy-five 4th graders helped out this May by removing brush from the prairie. They also learned about traditional camas harvest from Shawna Zierdt (Griffin parent, Native Plant Specialist and member of the Cow Creek Band of Umpqua Tribe of Indians) who demonstrated digging techniques and showed students how the relationship between Native people and the prairies is deep and present. This project has had a tremendous jump start, thanks to the outpouring of interest and support from the Steamboat community. I wish I could say that the prairie has been fully restored, but there is still work to be done. Invasive plants will continue to move in and will need to be removed manually unless the property is burned, which is an idea for the future. 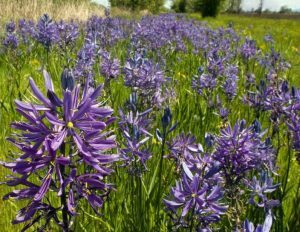 In the meantime, 1,000 camas bulbs are on order and will be planted this fall, most of which are expected to bloom the following spring. Some of the invasive plants will be covered with black geotextile material to kill the plants and roots, while others will be hand cut and pulled to keep them under control. The progress that has been made at this site in just a few short months is impressive. Special thanks goes out to SCP members and volunteers Jack Sisco, Paul Meury, Bonnie Blessing-Earle, Mark Fischer, Jim Leonard, Steve Lundin, Skip McGinty, Peter Reid, Elizabeth Roderick, and Joanne and Dave Schuett-Hames for sharing knowledge of this site, offering suggestions on how to proceed, and most of all showing up at work parties ready to work! We are also grateful to AmeriCorps member Hanna Jones, the US Fish and Wildlife’s Connecting People with Nature program, WSDOT, Griffin School, and the Washington Native Plant Society for their support and interest in this project. We welcome new ideas and volunteers to this project. Feel free to contact Thurston Conservation District staff member Stephanie Bishop at sbishop@thurstoncd.com to learn more about the project and/or how you can get involved. 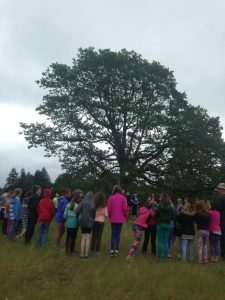 Donations: During our 2016 – 2017 fiscal year (July 1, 2016 through June 30, 2017), we raised $20,727 for Capitol Land Trust, earmarked to finance part of their activities within the Steamboat Peninsula Region where most of us live and/or own property. Donations during the month of June were enhanced by three of our donors matching, dollar for dollar, any donations not exceeding a combined total of $1,500. This allowed us to exceed our annual goal of $15,000 in collections by more than 33.3%. This matching program was a first for the Steamboat Conservation Partnership. Over the eight years of our existence, we have raised $134,129 for Capitol Land Trust, which is $14,129 above our goal of $120,000 for that eight-year period. We should all be very proud of generating these funds to ensure that many of our natural areas will be available to our children, grandchildren, and beyond. Activities: This spring many of us in the Steamboat Conservation Partnership, along with friends and neighbors, began restoring a remnant portion of Schneider Prairie. The remnant is located on the north side of the Highway 101 overpass, where the majestic oak tree stands on the SW corner of Steamboat Island Road and Sexton Road. Many of us pass this site on our daily commutes. 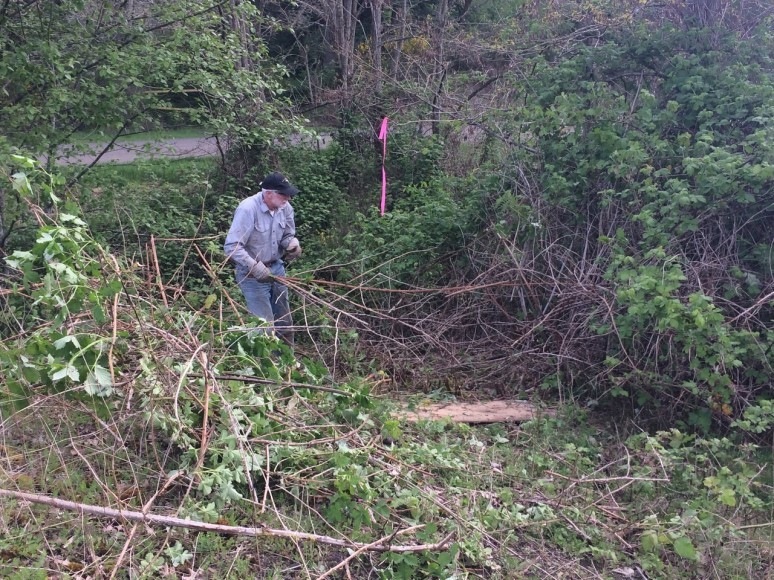 We removed blackberries, scotch broom, and invasive non-native trees. Later, 4th Grade classes from the Griffin School worked the site to prepare for fall plantings of native prairie wildflowers and grasses. The project is led by Stephanie Bishop, a parent of Griffin School kids who works for the Thurston Conservation District. Long-time Steamboat Conservation Partnership participants Jack Sisco and Joanne Schuett-Hames helped organize the efforts. This special project builds on past efforts of the Griffin Neighborhood Association. Years ago, members of the Griffin Neighborhood Association planted Gerry oak trees and other native vegetation in this and other areas after the freeway overpass was built on Steamboat Island Road. At that time Griffin School teachers initiated a long-term monitoring project on the nearby Schneider Creek. This newly restored area will be will now be used as a second outdoor educational site where students learn about our local prairie, and the traditional uses of prairie plants by Native Americans. Land Stewards Mark Hendricks, Deanna Frost and Jack Sisco at Oakland Bay County Park. Nothing is quite as sweet in the conservation world as completing that land deal to protect a special habitat for generations to come. 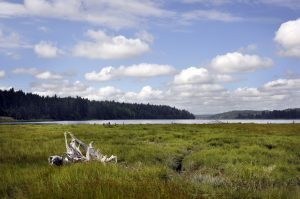 Whether it’s finalizing a conservation easement or the outright purchase of a piece of critical shoreline, wetland or intact forest, the news is met with much celebration and sense of satisfaction – that more land is protected into the future. But acquiring the land is just the first step in conservation. The next step is making good on the commitment to keep the land in as good condition – or better – than it was when protected. Good habitat stewardship is key so the plants and animals that depend on that piece of natural world will continue to thrive. 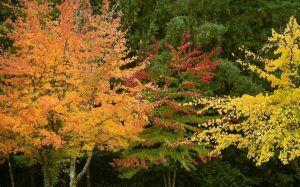 Good stewardship may include restoration, such as removing shoreline armoring and non-native invasive plants, or replanting an old field with native trees and shrubs to recreate a once-existing forest or wet meadow. Often, good stewardship includes visiting a site to ensure that agreed-upon easement conditions are being adhered to, checking for encroachments, or picking up trash. Capitol Land Trust relies on dedicated members to ensure that our protected lands remain in good condition. As more of the protected sites we manage become open with trails and facilities for the public, it will take more work to ensure that sensitive habitats are maintained and the “human footprint” isn’t having a negative effect on them. Land Steward Jacqueline Winter monitors North Fork Goldsborough Creek Preserve. That is why we are always looking for volunteers willing to spend some time and energy to visit and monitor our sites as stewards or occasional workers; to ensure that we are keeping our commitment to landowners and our community to be good stewards of the lands we manage. Can I become a Volunteer Land Steward? Yes! We’d love your help. At the center of Capitol Land Trust’s mission is the perpetual stewardship of the properties we have conserved – into the future. We visit even our more remote properties at least once a year to document their condition, check for dumping and trespassing, and visit with neighbors. For private properties on which CLT holds a conservation easement, we also meet with the landowner to be sure they are fulfilling the terms of the conservation easement. Volunteer Land Stewards are key to our long-term success. They monitor sites, usually with a CLT staff member. During annual monitoring visits, Land Stewards observe, take notes and photographs, and may act as guides. After visits, they fill out monitoring report forms that help us create final monitoring reports. Land Stewards who live near or travel to a CLT-conserved property provide a critical service throughout the year by alerting CLT to any problems. 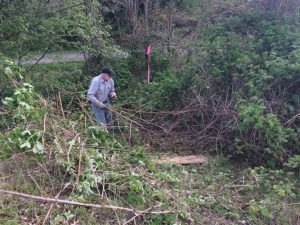 Depending on the needs of the property and the volunteer, a Land Steward also may add visits and do other activities (such as removing invasive plants or organizing a volunteer work party). We match volunteer stewards with a property that fits their interests and physical abilities and (if possible) is near where they live or travel. Planting live stake cuttings at Bayshore Preserve. Photo by Bruce Livingston. A Land Steward’s time commitment depends on the CLT property and the volunteer. An hour is needed prior to the monitoring visit to review the previous year’s report; part of a day is needed for the visit and an hour or so after to fill out the monitoring report form. Typically, new Land Stewards are trained during their first visit to their assigned property – or they may join a monitoring visit to another Land Steward’s property to observe the protocol. 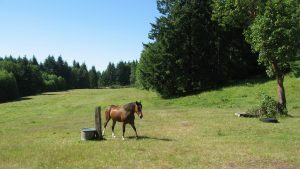 The reward for being a Land Steward is that you get to visit unique and beautiful natural areas, farms, ranches, and timberlands – most not open to the public. You also know you are giving back to your community. Call our office if you are interested in being a Land Steward and we will match you with a suitable property. 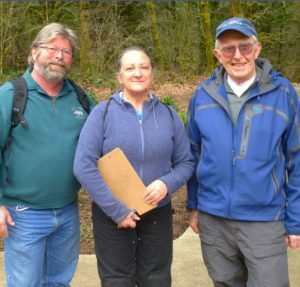 Thank you to all of our current, and past, volunteer Land Stewards for your ongoing support towards our efforts to preserve natural and working lands in southwest Washington! Reprinted with permission from Issue 62, Fall 2016, of the Capitol Land Trust News. The Capitol Land Trust and Griffin Neighborhood Association created the Steamboat Conservation Partnership in order to conserve the natural areas that make the Eld and Totten Inlet watersheds so special. Click here to learn more about how you can support the efforts of this unique partnership. And click here to learn more about preserved habitat right here in the Griffin/Steamboat Peninsula area. Fall is here and the autumn leaves are beautiful. Let’s make sure we keep the natural beauty of our area by supporting the Steamboat Conservation Partnership (SCP). 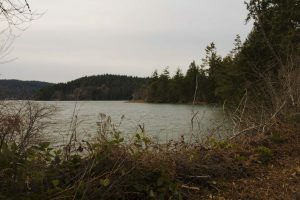 The Partnership is an agreement with Capitol Land Trust where contributions are earmarked to help conserve sensitive areas within the watersheds of Eld and Totten Inlets. All contributions are tax exempt. Capitol Land Trust uses these contributions to cover expenses in working with local property owners for the voluntary conservation of their environmentally sensitive and critical properties. Your contribution to the SCP ensures that your support is used to conserve habitat right here in the watersheds feeding the Eld and Totten inlets. Click here to find more details about the SCP. And click here to learn more about areas already conserved in the “Steamboat Conservation Partnership Region”. Contributions to the Steamboat Conservation Partnership may be mailed to the Capitol Land Trust with “SCP” in the check memo area. Or click here to make a contribution online, through the Capitol Land Trust’s web site. Please remember to add, to the “Note” field on your online contribution, that the contribution is made for the SCP. Thank you for your support of the Steamboat Conservation Partnership. We just completed our 7th year of successful operation. It’s time to look back on our accomplishments and ahead to the future. During our just ended 2015-2016 fiscal year (July 1, 2015 through June 30, 2016), we raised $13,905 for the Capitol Land Trust (CLT). This is $1095 below our annual goal of raising $15,000. Over the seven years of our existence, we have raised $113,382 for the CLT, which is $8382 above our goal of $105,000 for that period. We should all be very proud of generating these funds to ensure that many of our natural areas will be available to our children, grandchildren and beyond. A stewardship fund established to protect the remaining 175 acres of the Wynne Tree Farm that was conserved last year. The 530 acre Wynne farm has now been conserved. This jewel of a farm is located in the Schneider Creek Valley with the headwaters of the creek. Wynne Tree Farm. Image credit: Capitol Land Trust. Click for a larger image. The SCP has three committees: 1) Fund raising; 2) planning or technical committee; and 3) general operations. We are always seeking members to serve on these committees. Let us know if you are interested. The fund raising committee solicits continuing, monthly contributions, as well as periodic contributions, including end of the calendar year contributions in December and hosts tables at the annual Capitol Land Trust Conservation Breakfast every February. The planning committee is our most active committee and, with the assistance of CLT staff, researches properties within the Steamboat Peninsula region that would be appropriate for long-term conservation. Contacts are made with property owners explaining the SCP and our relations with CLT, and inquiring if these property owners are interested in conserving or preserving their properties. As you know, all conservation or preservation efforts are entirely voluntary with the property owners. Through these efforts, CLT is in discussions with several property owners who may seek to conserve their property. The general committee consists of all members of the fund raising committee and planning committee. This committee basically runs the SCP. We thank our past contributors to the Partnership. Please once again make an annual contribution to ensure natural areas continue to be conserved. While many of you like to make your donations at this time, the beginning of our program year, others donate at the end of the calendar year or at the Annual Capitol Land Trust Breakfast in early February. If you have never made a donation to the Steamboat Conservation Partnership before, we hope you will remember us when planning your tax deductible donations for the year. Donations are welcome in any amount and at any time convenient to you. We are currently embarking on an effort to further publicize SCP and solicit additional members. The July 16th bike ride on the Steamboat Peninsula and notices on Nextdoor are part of this effort. You are invited to attend Capitol Land Trust’s annual summer gala and auction at Ralph Munro’s home on Saturday, August 13, from 5-9 pm. General admission tickets are available at $85 per person as well as deluxe tickets at $175 per person. Click here for more details. This is a great event and an opportunity to meet many other contributors to CLT. Click here for more information regarding the Steamboat Conservation Partnership.